Protecting Your Data on the Web: So what? This guide is a companion to the Protecting your Data on the Web Savvy Researcher Workshop. How to Burst Your Filter Bubble! Personalized results provided by websites and search engines can give us results that we want faster. Websites that we commonly go to are easier to find, as they appear higher up in search lists. Location detection is helpful when you simply want a restaurant that is close by. Our login information can be saved so we don't have to keep retyping it, if we are on a private computer. Many of the competency standards deal with searching and so are relevant to this discussion about standard search engines. The definition of information literacy in this Framework also involves effective and efficient ways of searching and evaluating information. Is the Filter Bubble real? Feuz, Fuller, and Stalder reject the hypothesis that the effects of personalized web searching are subtle, basing this conclusion on quantitative findings. There is another reason to be wary of search results and question their objectivity. Google's PageRank - which refers to the system for ranking or ordering search results - is based not on the quality of information on a website, but rather on the website's popularity, that is, on how many other websites link to that particular website, and how high those websites are ranked. Information literacy is about selecting and evaluating information for its quality, but if we accept search results in the order in which they appear, we are really getting information that is most popular, not necessarily high quality. Of course sometimes the most popular websites are great sources of information, but not always. 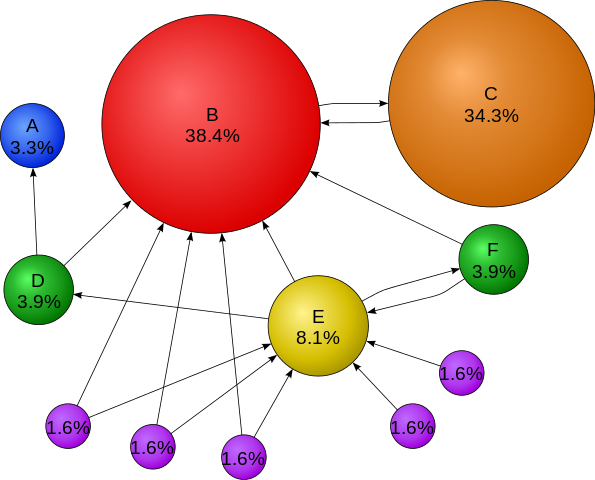 To the right is a depiction of PageRank, which is based on what are called "backlinks" - the pages that link to a particular search result. Each circle represents a web page, and the arrows represent links to that webpage. The percentage represents the rank of the page. As you can see, the smaller circles - the ones with the lower rank, have fewer pages linking to them, or the pages linking to them have low percentages. The pages with higher percentages have lots of other pages linking to them, or have other pages with high percentages linking to them. For example, the orange page does not have very many pages that link to it. However, the page that links to it has a very high percentage, or rank, relative to the other pages. Thus, orange also has a high PageRank. This site is a tool for analyzing websites based on their backlinks.